The M3 Stuart, officially Light Tank, M3, is an American light tank of World War II. It was supplied to British and Commonwealth forces under lend-lease prior to the entry of the U.S. into the war. Thereafter, it was used by U.S. and Allied forces until the end of the war. The British service name “Stuart” came from the American Civil War Confederate general J. E. B. Stuart and was used for both the M3 and the derivative M5 Light Tank. In British service, it also had the unofficial nickname of “Honey” after a tank driver remarked “She’s a honey”. 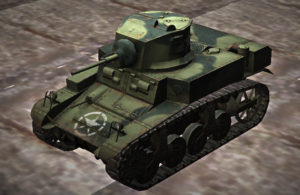 In U.S. use, the tanks were officially known as “Light Tank M3” and “Light Tank M5”.